After more than two years of development – and enough coffee to fill several Olympic-sized swimming pools – Kindi's secureSWF v4 is queued up and ready for download. This landmark update packs 100 new features into our bestselling ActionScript obfuscation and SWF encryption solution, including an entirely re-engineered and super-efficient renaming engine, secure domain locking, better integration, and many other significant additions. We've redesigned secureSWF's identifier renaming from the ground up to give you better protection, faster performance, and more control than ever. Highly increased ability to rename much more identifiers than previous version. More stable with clear auto selection and exclusion. Configurable post build renaming check. More aggressive use of ActionScript keywords for new names. Incremental renaming. Reload the mapping table in the future. Single JSON based renaming mapping table for the entire project. Advanced and easy-to-use identifiers browser to change renaming settings. Configurable to select all members through parent node. Protect your intellectual property from sophisticated decompilers with secureSWF's beefed-up security algorithms and options. All protection algorithms have been reworked to break latest decompilers. New Integer Data Obfuscation protection options. Enhanced Control Flow Obfuscation for stability. Manually set a randomization seed to allow identical files regeneration. With secureSWF v4, potentially sensitive embedded strings get even more shielding from prying eyes. Choose between fast RC4 or extra-secure AES encryption algorithms. Configurable key length to balance file size and security. Select strings using a pattern. Get warnings for strings left unencrypted. Keep your code from running on unauthorized domains with secureSWF's industry-leading domain locking features. Choose between fast RC4 or secure AES encryption algorithms. Use wildcards such as * to include all sub domains. More secure and more stable. 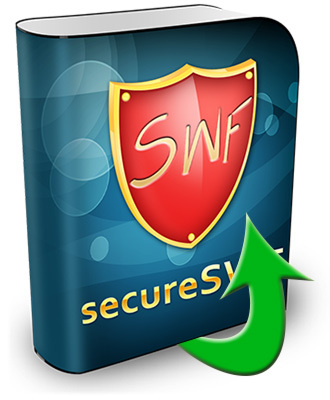 Cloak your SWF files and lock down your intellectual property with secureSWF's powerful and customizable encrypted loader. Thanks to expanded file format support, secureSWF now offers even greater file import/export flexibility and compatibility. Fully supports SWF v13 and v14 with LZMA compression. Latest Flash CS6 and Flex 4.6 support. Supports APK files for Amazon market place. New JSON based project file format. Imports files from other projects. Projectwide code optimization puts overweight ActionScript on a diet and gives users a snappier experience. Makes methods static when possible. Replaces constants with their literal values. Converts read-only fields to constants. Replaces method calls with the method code (function inlining). Configurable code optimization for each package, class, or class member. secureSWF's intelligent SWF optimization makes your Flash apps lean and mean and blazing fast. Super compression uses LZMA when possible. Reduces 2D graphics shapes size. Merges 2D graphics lines to improve performance. No matter what development platform you prefer, secureSWF v4's OS-native GUI has been updated with an improved appearance and more efficient workflow. Separate native GUI for each platform. Native executable for Windows using standard look-and-feel. Cocoa based GUI for Mac OS X 10.5, 10.6 and 10.7. GTK 2 based GUI for Linux. Automatically finds Flex and AIR SDKs. Manages Flex and AIR SDKs. Easier to use protection presets. Help information attached to each set of options. Always easy to get along with, secureSWF now plays even nicer with third-party tools and environments. Separate cross-platform Java-based engine contained in a single Jar file. Fully featured command line interface (same used by GUI). Auto-generate Ant script from GUI with all necessary files including engine jar file. All project file fields can be used in Ant. All project file fields can be overridden in CLI. Multiple CLI modes: analyze, execute, run, activate. CLI output can be in JSON for easy parsing. Generates project files from CLI using any preset.